Owning a pet Chameleon, anole lizard, geckos and other woodland and forest species is accomplished by creating a terrarium replicates at tropical or rain forest. Specific recommendations are described below. In general, preferred terrarium substrates is a layer of gravel covered by the material used by an air conditioning filter. Cover this with 2 to 3 inches of soil. The terrarium can be decorated with twigs and branches. Use a plastic or glass top to hold moisture in the tank. To reduce humidity levels, use a screen for the tank top. Anole Lizard Species: Lizards from this family are found all over the world, with lizards in the wild spread through escaped pets. The species can be as small as a few inches in length to larger members of this family that can grow as large as 18 inches. 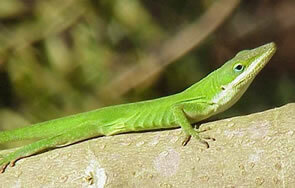 The North American Green Anole is well known for its' color shifting abilities. Terrarium should resemble a dry woodland. 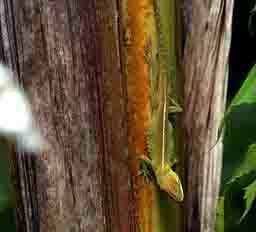 All Anoles can shift color, which is caused by shifting pigments related to stress. Cages with more than one lizard should be at least 4 feet x 5 feet. Knight Anole Lizard: This Anole Lizard can grow to 15 inches to 18 inches. In the U.S. it is found in Florida. Brown Anole Lizard: This type of anole is seen in pet stores. They grow to 8.5 inches in length. Terrarium should be 20 gallons for a small lizard to larger than 50 gallons depending on the size of the Brown Anole. Chameleons: Flap Necked, Senegal and Graceful chameleons are often trapped and kept by hobbyists. These lizards are not easy to maintain in captivity and are therefore not recommended to pet owners. Few live more than a few months in captivity due to the level of care required to keep them healthy. Do not purchase a Chameleon that was captured from the wild (often cost less than $50), since the stress will probably result in a decline in health. Instead, spread approximately $100 and get a Chameleon that was bred in captivity. Chameleons become stressed when handled. Many amateur hobbyists should avoid this pet lizard since they are delicate and can be hard to handle. 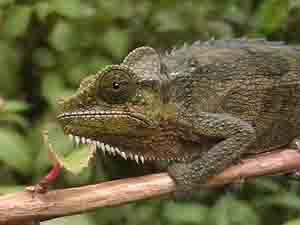 A preferred pet chameleon for home care include the Four-horned and Mountain Chameleons. To determine if a Chameleon is healthy when purchased check the weight, color and eyes. Any encrustations around the eyes can signal a potential health problem or a stressed animal caused by captivity or shipping. 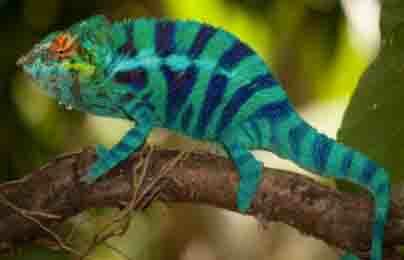 Chameleons need to be kept in very large areas (4 ft x 30 inches wide. The lizard cage should be wire mesh and offer sufficient vertical space. The terrarium should be well ventilated and filled with limbs, trunks and plants such as potted hibiscus or Ficus benjamina. Feed a variety of insects, not just one. These include butter worms, wild insects and meal worms, Some will eat greens, blossoms and vegetables. Chameleons will only drink droplets of water on plants or a dish that is aerated by a pump. Indoor pet chameleons require calcium supplements. Veiled Chameleons: These chameleons can grow to two feet in length, Cage high temperature should be 70F. This omnivore likes to eat leaves from Romaine, Escarole, Hibiscus, Nasturtium, Ficus benjamina, Syngonium, Epipremnum. 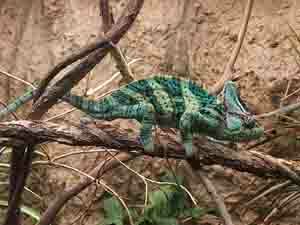 Panther Chameleon: Male panther chameleons can grow to 20 inches. Colors are turquoise or green banded. Jacksons Chameleon: Males grow to 14 inches. Thrive in daytime temperatures that are 74F to 78F (23-25.6C) and night temperatures at 50F to 60F (13.9-17C). Day Geckos: There are 25 of 60 species sold as pet Geckos. These species are both caught in the wild, or preferably bred in captivity for pet stores. With some exceptions, it is not a good idea to place males of different species in the same terrarium. When in captivity, Geckos act in ways that are similar to packs of dogs, with a hierarchy quickly established. If you notice that one of your Geckos kept in a group has an abnormal color, this could mean that the Gecko is stressed and not eating. If this is the case the pet Gecko should be removed from the cage. They are active during the day and at night. They are native to Madagascar, Seychelles and the Comoros. Gold Dust Day Geckos have also established themselves in Hawaii and Florida, They are easy to breed and care for in captivity. Size: Varies by type. 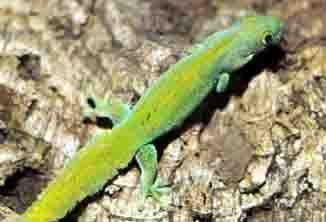 The Neon Day Gecko is 3 inches. Standings Day Gecko is 12 inches. Male Geckos have a budge at the tail base and female geckos have pores that continue with no interruption to the tail. Gecko Diet: Geckos eat insects such as crickets, saps juices, overripe fruits nectar, pollen, overripe fruits. Insects should be dusted with vitamins. Water is consumed from droplets on plants. No matter what lighting or diet is being used, use vitamin supplements that provide vitamin D3 and Calcium. Mist plants daily to provide the needed water droplets. Gecko Cages: Most Geckos require a Woodland/Tropical terrarium such as those offered by Zoo Med. Purchase a "tall" tank that is at least 15 gallons if 2 to 3 small Geckos are kept as pets. Multiple larger Geckos require a 30 Gallon Reptile Tank (114L, 16x16x30 in inches) to 80 (189-303L) gallon tank such as this 50 gallon tank (18x18x36 from Reptimed). Decorations/Climbing: Decorate with items such as cork bark tubes and hollow logs. Lighting: The terrarium can be lit with both a fluorescent bulb and a a flood light that encourages plant growth. Use lights to warm one or two areas for basking in the heat/light. Geckos like to bask on bamboo. Use a aquarium sealant to attach an end of the bamboo to the side of the Gecko cage. 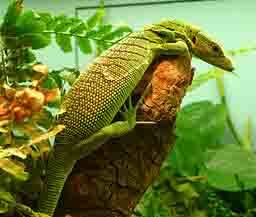 Emerald Tree Monitors: The most popular Emerald Tree Monitor is the emerald colored V. prasinus. The lizard is from Papua/New Guinea. The lizard grows to a maximum length of 30 inches (75 cm). Be careful when handling this lizard since it has sharp claws and a strong jaw. Over time the lizard will get used to your handling. A large cage is needed for Emerald Tree Monitors. These lizards eat a diet that includes crickets, grasshoppers, June beetles, king mealworms and baby mice. They will also eat lean beef, slugs and canned cat food. Daytime terrarium temperatures must be between 84 to 92 F (28.9 - 33C). Humidity needs to be kept at 75?. At night, the terrarium temperature should be between 68 to 75 F (20 to 24C). Include a basing area of 95 to 98 F (35-36.7C). The terrarium should be tall and include limbs for climbing. Include hiding places for the Emerald Tree Monitor to hide. Health issues such as endoparasites can be a problem. A veterinarian can test feces samples for the parasites.